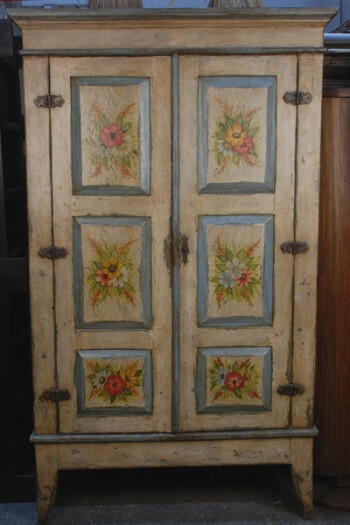 Hand painted wood "armario grande" (large armoire), multi-colored paintings in floral motif on six rectangular front panels. Original hinges hardware and lock-set w/ 2 keys. Acquired in Tiradentes, Brazil on a recent buying trip and dates from the late 19th century. It measures 47" wide x 28" deep x 85" tall and the back is drilled for audio visual equipment access.